I always walk by the cute storefront of Cloak and Dagger in my 'hood but have yet to step inside. I'm sure it's chockfull of charming finds. Kodak Portra 400 on Canon 1V (cropped to square). 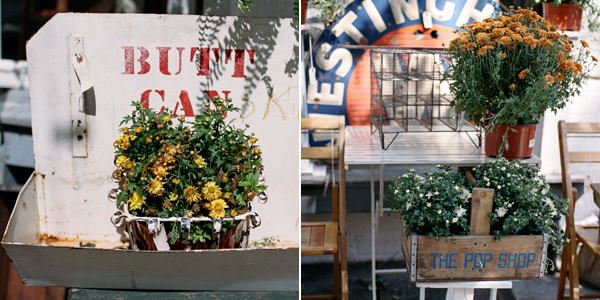 On that same block is this great antiques shop with killer finds, The Upper Rust. I would love to just take home everything from that place. Apologies for lack of content on the blog recently. As other things are picking up, I'm losing time to shoot for myself. I was cleaning out my harddrive the other day (was down to like 20GB of free space, eek!) and it's amazing how much J and I used to squeeze in on a weekend day. Just following along with the pictures, I was reminded of how many new places we'd check out and photograph every weekend. Nowadays, weekends are weddings and errands and bumming in the downtime. Alas, I am only human. As your storage requirements increase, don't forget to backup your backups. Tedious, but necessary.